Players can gain achievements by completing Daily Quests and gain rewards. 【Function Access】Click “Quest” in the bottom right of Main Panel to enter. 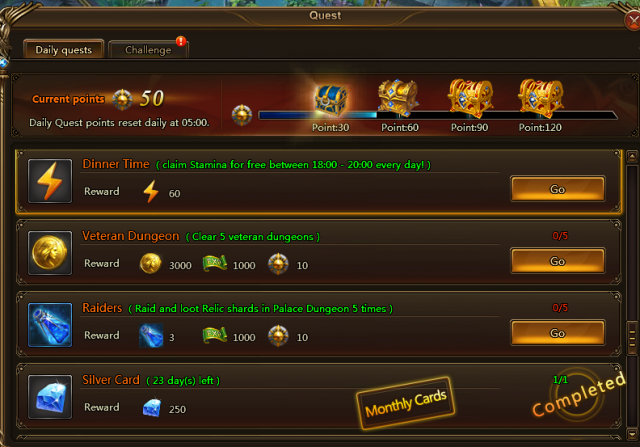 ·When players log on, daily quests are automatically received. With each quest completed, corresponding rewards are gained and player gets 10 points. ·When points reach a certain requirement, players can claim a chest reward. ·Quest points will reset daily at 5 AM. ·Click“Achievement” in Quest Panel to access Achievement Page, meet the requirements there to get achievements. ·Getting achievements also grants rewards.